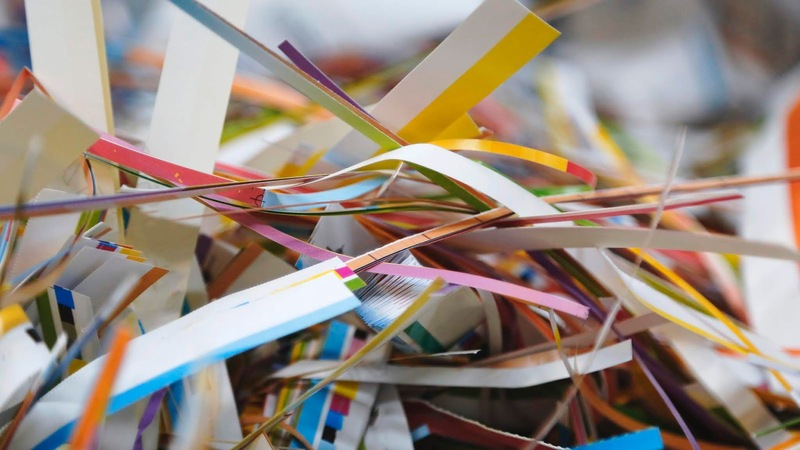 Recycling Works: Is My Shredded Paper Recycled? Is My Shredded Paper Recycled? Shredded paper is recyclable in any recycling process that accepts paper in their recycling bins. There are, however, a few things we need to keep in mind as we put shredded paper into our recycling. All paper consists of fibers and the longer the fiber, the more valuable the paper is during the recycling process. Since paper is generally recycled over and over, the fibers become shorter and may need to be "downcycled". These materials are still valuable, but they’re not as valuable as nice, white office paper with long fibers. Once you shred your personal documents, it shortens the fibers and lowers the grade of paper from high grade to mixed grade. Mixed grade paper is still recyclable, however. Shredded paper has to be contained during the transportation process for a couple reasons. First, as the recycling truck services recycling carts and bins, lighter weight materials that are not contained can blow around or out of the truck and essentially make a huge mess. Second, containing shredded paper keeps it from sticking into the small spaces inside the truck, which could lead to the inner workings of the truck being compromised. When you do contain shredded paper, it is best to place it into a clear or opaque plastic bag so the people on the sort line at the recycling plant can tell at a glance that it is actually recyclable material instead of a bag of trash. All in all, shredding paper with personal or important information is extremely necessary anymore considering the rate of identity theft. Paper that has been shredded is a recyclable item in most recycling processes, including those at Recycling Works.